It is a conversation Ghana has been having every two years since 1982 and it centres on winning the Africa Cup of Nations. Each time the competition comes around, Ghanaian expectation goes into overdrive, players line up to declare their ambitions to win, officials pledge they will work hard for it and varying experts look convince a passionate football population that victory is possible. And yet, Ghana's Nations Cup trophy count of four has stayed the same for the last 30 years, despite reaching the final in both 1992 and 2010. In 1982 Egypt had won only two trophies - they now have seven - while Cameroon's then empty trophy cabinet now holds four African crowns. Moments after Ghana sealed qualification with a 1-0 win to complete an aggregate 3-0 victory over Malawi, coach Kwesi Appiah started what will be a national obsession over the next few months. "I won the Nations Cup as a player in 1982 and I want to win it as a coach," he said. "We will go there and try to win it." Ghana has reached the semi-finals of the last three tournaments, losing to Egypt in the final on Angolan soil two years ago. In South Africa in January, Ghana FA chief Kwesi Nyantekyi says the target is to not just go one step further for Black Stars fans - but for the entire West African region as well. "Since 1994 no country from West Africa has won the Nations Cup and for a region that is supposed to be the talent base of African football that is not good enough," he told BBC Sport. "We are determined now to change that and in my meetings with the players, that is one of the things I tell them. "I have told them that their period in the national team will count for nothing without a major trophy. "We are all very keen on and that and will do whatever it takes to win." To achieve that, coach Appiah reckons he must get two key areas right between now and January's finals - with Ghana set to learn their opponents when the draw is made on 24 October. An accomplished left back in his day, Appiah reckons there are issues with both the full back slots. He also has concerns over his strike force with Asamoah Gyan having looked burdened in recent games by the responsibility of scoring the goals. Like most members of the squad, Gyan says the constant reminders of Nations Cup failures are getting to the players - especially after the highs of reaching the last two World Cups, reaching the quarter-finals in South Africa two years ago. "It is frustrating for us," he said. "Every day we get reminded that we have not won a major trophy despite putting Ghana on the map with what we have done at the last two World Cups." 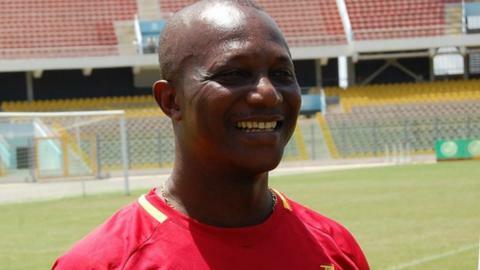 Meanwhile, coach Appiah says the fact that the whole country desperately wants Nations Cup success is not pressure. "I will put it as a challenge because Ghanaians are used to the Cup of Nations and they want a trophy now," says a man who will be the first local coach to lead Black Stars at a Nations Cup in over a decade. "I have to pick players who are prepared to die for the nation and win. We just don't have to go to the competition, we have to go out there and try to win it." The problem for Appiah is that former coach Goran Stevanovic said exactly the same thing ahead of this year's finals and despite a strong start, his side's fourth-place finish eventually led to his dismissal.